C. Cretors and Company dates itself from the City of Chicago Peddlers License issued to Charles Cretors on December 2, 1885. In truth, the company dates from an earlier date. Charles Cretors was born in Lebanon, Ohio, to a family of chair makers. After he married, he and his wife went to Fort Scott, Kansas, where he became a success with a cracker bakery. After several years, he sold the bakery and headed back east near Decatur, Illinois. They were robbed and left with nothing but their wagon and the clothes they had on their backs. Charles arrived in Decatur and convinced the pastor of a new church that he was the man to paint the church structure. Within a few years, Charles Cretors had become a solid citizen and as a sign painter and general contractor, he rounded out his investments with a candy store - the type that hand-dipped chocolates in the store window. As any store manager, he had to consider the trends of this time. Charles bought a machine for roasting peanuts in the shell from a small company in Iowa, probably a Bartholomew Peanut Roaster. The machine was poorly designed and built, but the product was very popular, and Charles reasoned that a well made machine could have a broad appeal and could be a big seller. Not many people have the courage of their convictions that Charles Cretors had. He sold his business in Decatur and moved to Chicago to build a better peanut roaster. All the foundry patterns for the first machines were made by Charles on a foot powered lathe. The patterns were used to make the iron and brass castings from which the first machines were built. Glass - bevel edge French plate throughout. Signs - bevel plate mirror ... with background chipped in by sandblast process, lettering and borders in color: mounted in highly polished metal frame. Printing - is of the highest class, nothing but the best material, nickel plating being used. We take special pride in the finish of these machines. Frame and gear go through the same process as a carriage of high grade; striping is in gold leaf and color. We used Harlands imported, world famous, English finishing. The attraction of the candy maker in the store window convinced Charles of the need for some form of action on his machine. The steam engines were a natural source of attractions. People were used to railroad engines, but rarely saw anything so small and compact. To take advantage of the situation, Charles put the steam engines out front where they could easily be seen and made them as attractive as possible with nickel plate and polished copper and brass parts. In addition to the steam engines, there was a small clown or "Toasty Roasty" man, who cranked a tumbler full of the peanuts on top of the roasting drum. His commitment to this concept is shown in a quote from the 1913 catalog: "In purchasing a machine, you should pay particular attention to the "motive power", as it is a very valuable feature. If your power is not attractive, you cannot expect to draw any new trade; the more attractive your power, the greater your business will be; no engine or device equals our engine in this most important respect." In order to test his machine, it was necessary for Charles to operate it on the street as the customer; he hoped to sell the new creation to would. This, of course, required a peddler's license. In addition to testing his machine, Charles found his first employee other than his family. The machine was being operated on Randolph Street in Chicago. Today this is in the middle of the financial district on the south edge of Chicago's Loop, near the Randolph Street Railroad Station. One of the traveling salesmen that used the train station stopped and bought some peanuts and asked Charles if he could build another machine and how much it would cost. On his return several months later, J.M. Savage had sold some of the machines. Savage later manufactured commercial mixers for manufacturing caramel corn and sold one to Marion's Popped Right, Inc., which is now operating as Wyandot Inc. In the beginning, the primary productions of C. Cretors And Company were peanut roasters, but in order to survive, Charles used his machine shop and inventiveness to fill in the gaps. A letterhead from that time indicated that all that was needed was a good sketch to build whatever you needed. The peanut roasters were often used for other items such as roasting coffee or parching corn. Parched corn is very dry sweet or flint corn and Charles began to work on an alternative to the current method of popping corn. At that time, popcorn vendors popped corn in a wire basket over an open flame and poured melted butter and salt over the popped corn. The end result was either too soggy or too dry and did not sell very well. Charles reasoned that if he could pop the corn in the seasoning the end product would be much better. In 1893, Charles Cretors patented the process and machine for popping popcorn in a seasoning mixture of leaf lard and butter oil. The result was an excellent product that was far superior to anything produced before. Before long, the peanut roasters with a popcorn attachment became popcorn machines with a peanut roaster attachment! The first popcorn machines had long legs and were small enough to be moved easily out unto the street, where passing customers could see them. By the early 1890's the popcorn wagon with its large wheels had evolved. The popcorn vending wagon permitted the operator to take his machinery wherever the business was. 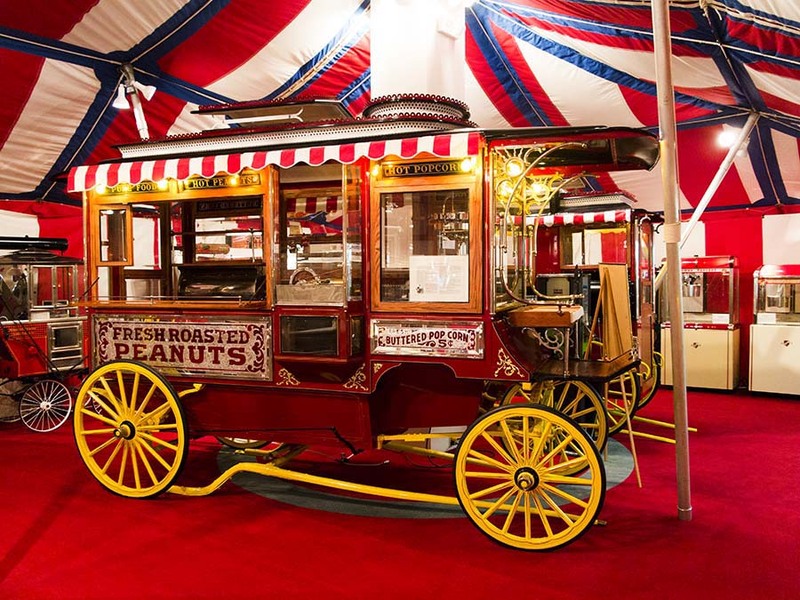 The first major event to see a Cretors popcorn wagon was the 1893 Colombian Exposition in Chicago. At first, the new confection had not sold well. People were not inclined to spend their money for an experiment. This led Charles Cretors to give away popcorn (people will take almost anything that is free! ), and then begin another batch. The wonderful aroma of freshly popped corn and the animation of the steam engine and clown, kept people in line to get the new confection. Cretors popped popcorn, has been a best seller ever since. The Cretors popcorn wagons were a great deal more than the popcorn machines that most people see in a theatre lobby today. These wagons were mobile, self-contained concession stands. White gasoline (Naphtha) was burned under a small boiler to generate steam to run a steam engine, which provided the mechanical energy to operate the agitator in the popcorn popper pan, and to turn the peanut roaster drum. White gasoline (Naphtha) also heated the peanut roaster, and on some models, provided light from a gas lamp much like a Coleman Lantern used by campers today. The steam discharged from the steam engine, was directed to a hollow copper tray under the popped corn to keep it warm and crisp. Steam under high pressure from the boiler, was also available to blow the loud shrill and attention rousing whistle mounted on the top of the wagon. White gas today would be called Naphtha and was widely used at the turn of the century. The wagons of the late 1800's were nearly all small, hand pulled carts for use on street corners or at fairs, or public events. After 1900, larger horse drawn wagons began to appear. The most popular and common, was the larger Model "D" Wagon, and smaller Model "C" Wagon which were horse drawn and capable of being able to travel to any event, no matter where it was, or what the weather might be.